Happy fasting and Let's shop with Coco Fashion! | Ismurfshion. Ismurfshion. : Happy fasting and Let's shop with Coco Fashion! Happy fasting and Let's shop with Coco Fashion! First, I want to say Happy fasting for all moslem in the world :) Because I'm a moslem too, of course I'm so happy for this month! Ramadhan is coming, right? :) I think everyone loved it too, eh? :) Because we can do a breakfasting with our family, friends, and this what makes our friendship became closer, because normally we would plan something interesting and do things together, such as social events to help others people (in Indonesia called Kaum Dhuafa). So, when we are fasting, we certainly will feel hungry and thirsty, we will be lazy to go out, we become lazy for shopping, or doing something else, it's because the weather in Indonesia is always changing, too. Don't worry, we can shopping whenever we want, so many trusted online shop in the world uh, why so worry? Just open your pc, click the link and you can choose a clothes what you want, simple! 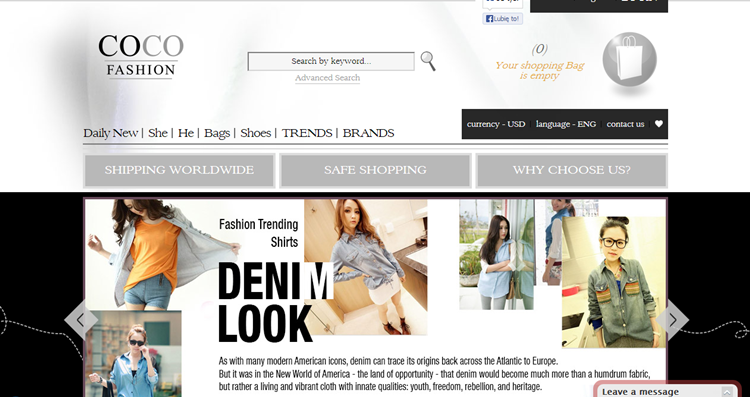 First, let me intoroduce this online webstore, Coco-fashion Retail / Wholesale retail ! Coco Fashion is an international online fashion shop with a variety of Women Clothing for Retail, Wholesale and Drop Ship customers. Coco Fashion is formally and legally registered as a limited company. And wait, Coco Fashiin is selling asian- mainly korean fashion branded clothing for women, don't worry, they sell bags and shoes too. Actually, Coco-Fashion is online shopping site, where customers are presented Korean Fashion, Japanese Fashion, TaiWan Fashion, HK Fashion and Hong Kong Fashion; and are assured of famous quality brands and authentic designer labels like Ugo, Vivicam, Japanese Fashion Bag, You-too, Doreme, Hanee, Moom, Yoko, LY Fashion, Eastsun, Marloca, Miss Milan, Xianwei, Korean Fashion Bag - just to name a few. If you love Korean Fashion, why not? You can find best and latest Korean Fashion at wholesale fashion price and even more wholesale with volumn. Don't be afraid with the price! You can buy a dress only for $10 on Coco Fashion, click here ! And you can find cheap stripe dress only for $7,89, click here ! So cheap! Oh sure, I'm in love with this online webstore! The best is, they are shipping to worldwide! Oh noo, I'm in love with this snake skin heels, only $13,99, me want! You can find it here ! Stay update with Coco Fashion! Over 100 new styles every week. Stable stocks. Thousands unique, top fashionable dresses, blouses, jackets and others. Newest collections from Asia countries, especially from Korea, Taiwan, Thailand, Hong Kong and Japan. They make quality control for each item separately. Shipping department checks each item before packing, totally avoiding manufacturing defects, and care specially about sewing details and fabric quality. What are you waiting for? 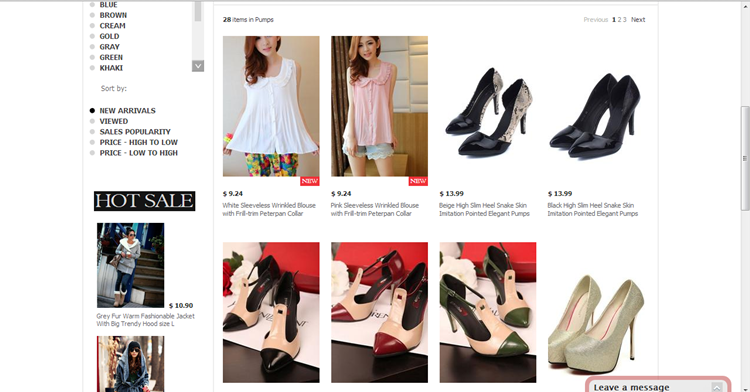 Let's shopping with "Just one click" on Coco - Fashion online webstore ! Thanks for sharing this! I will go and check them out too, I have come across their shops before... but never tried purchasing there! Gonna check out the shop! great site and great topic... if you have some time you can check mine Here. Thanks for sharing good tips for online shopping in india. Today everyone want to look trendy and stylish.I always search new fashion shopping sites which gives a great discount.When i saw your site i get some new thing which helps me look so trendy.I also purchased from cupshe which give various kind of fashionable products in cheapest price.Generally i bought some fashionable clothes using coupon codes and promo codes and save lots of money, you may also get some latest discount while using it. thanks to share these post.